← Pre purchase inspection, it’s what your customers think that matters! Pre purchase building inspection, slab causing rising dampness. Why should we worry about regulations and standards? It’s because we want to preserve the quality of our built environment by setting at least the minimum acceptable standards. Australian Standard is the minimum default standard. Some of the most experienced practitioners got together to input and develop the standards. Why is that important when you are buying a home? Surely it was all checked on completion. Yes perhaps, but also things could have been missed or alternatively owner could have done additional non complying works. When you are buying a home, it’s probably your biggest investment and you will want to know if there are significant issues, so that is what we look for and to give you the best balanced advice. Knowledge breeds confidence and knowing property condition and what to do about it will make you confident and comfortable about making the right decision. In the example below the concrete paving to external areas was built too high and without proper slope and drainage. So What? As it happens, trapped moisture not only breached damp proof course and caused rising dampness but also dampness increased termite risk and caused foundation heave cracking the slab. 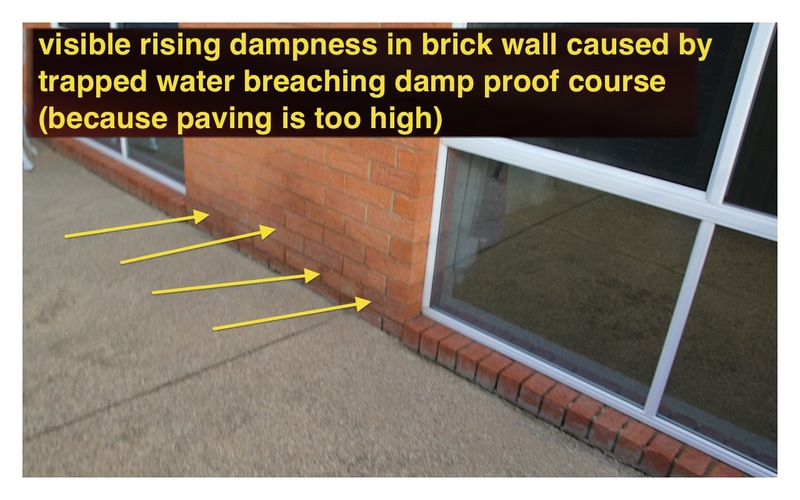 If you look carefully you will see brick weep holes partially obstructed by paving and blocking water escape. I had no alternative but to call the paving non compliant and recommended demolition and reconstruction at a lower level and to correct grade and including improved drainage. Is this enough to sink a property sale? You bet! This entry was posted in Building Advice, Pre-Purchase Inspections and tagged defective paving, pre purchase building inspection, pre purchase inspections, pre settlement inspection, rising dampness, termite risk. Bookmark the permalink. 2 Responses to Pre purchase building inspection, slab causing rising dampness. Particularly useful posting Pre purchase building inspection, slab causing rising dampness. | Building Expert.. Keep publishing.